“It’s these guys’ worlds. We just post in it and shop in it,” said New York University Professor Scott Galloway of Amazon, Apple, Facebook and Google at Digital Book World 2016. During a talk called “The Four Horsemen,” Galloway argued that these four companies are taking over the world and continually disrupting the publishing ecosystem. Do PIGEONHOLE, SERIAL READER, CRAVE, and ROOSTER mean anything to you? If a growing trend has anything to do with it they soon will – they are all apps that allow readers to receive serialized novels. Serialized fiction first gained prominence in Victorian England and first appeared in newspapers. It was practiced by such literary giants as Charles Dickens, Leo Tolstoy and Joseph Conrad. It fell out of favor in the last fifty years, but is now making a rebound thanks to the iPhone. We released our first ebook resource today Formatting Ebook-Friendly Word Documents & Manuscripts, a handy guide which addresses the issues that can come from using Word content as a source for ebooks. 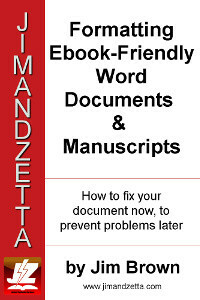 MS Word is a powerful program overall and an easy to use word-processor but it wasn’t designed as a tool to prepare content for ebooks, so there’s a number of normal practices and methods authors employ using Word features which appear perfectly fine in Word, but can lead to problems down the line when the content is used as a source for ebooks. This guide helps you keep your content clean of hidden dangers! It’s aimed at both beginners and seasoned Word users. The selling price is $5.99 but you can get Formatting Ebook-Friendly Word Documents & Manuscripts for a wallet-pleasing $3.99 till the end of February, exclusively from OmniLit.com! JZ Editorial: Harry Potter digital arm loses millions and sheds jobs. One part of the above article struck me as annoying. If you have a read at it you’ll see it. This is a ‘fact’ that should rankle anyone in the ebook industry – be they authors, publishers, or other industry people. This ‘fact’ is drawn only from the big publishers. It is THEY who have experienced a drop in ebook sales, and it is only THEY, and other publishers who choose to participate in the reporting of sales, who provide the (mis)information that the ebook industry is in decline. What about the thousands upon thousands upon thousands of authors who in their droves now choose to leave those very publishers and self-publish? What about the massive sales of ebooks by the #1 global book retailer, Amazon? NONE OF THOSE SALES FORM PART OF THE ‘REPORTS’ OF A DECLINING EBOOK INDUSTRY! That’s right. Amazon do not release their sales figures. Self-publishing authors are not asked for their sales figures. Independent publishers are not asked for their sales figures. The ‘reports’ of a declining ebook industry are based on a mere fraction of lop-sided figures from just a few entities in publishing (and ironically those who were at the outset dead-set AGAINST ebooks). The much more likely truth of the matter is that the ebook industry is extremely healthy and still growing. In 2014 it was estimated that almost ONE MILLION ebooks were released through Amazon’s KDP publishing platform. Ms Rowling resisted placing the Potter books into the ebook domain for so long, before deciding in 2011 to do so in a manner in which she could still control the books. She started ‘Pottermore’ – her own platform for selling the Potter ebooks to the fans hungry for them. It has now failed, largely due to existing fans getting their fill, no further Potter content, and no new fans coming in. So now you can find the Potter books appearing on the likes of Amazon, but it is still NOT Amazon who are selling it. If you click to buy you are still directed to Pottermore for the sale! The only difference is the ebook is sent directly to your device. YOU NEED TO PUBLISH IN DIGITAL FORM. “Two ongoing court battles involving large, technology multinationals may go before the Supreme Court this year, and the outcome of either case could alter the course of publishing as we know it — or maybe not. Source: Will Google, Apple, and SCOTUS Decide the Future of Book Publishing This Year?